Overview - Think of the greatest terror imaginable. Is it a monstrous alien? A lethal epidemic? Or, as in this harrowing masterpiece from Stanley Kubrick, is it fear of murder by someone who should love and protect you - a member of your own family? From a script he co-adapted from the Stephen King novel, Kubrick melds vivid performances, menacing setting, dreamlike tracking shots and shock after shock into a milestone of the macabre. In a signature role, Jack Nicholson plays Jack Torrance, who's come to the elegant, isolated Overlook Hotel as off-season caretaker with his wife and son. Torrance has never been there before - or has he? The answer lies in a ghostly time warp of madness and murder. Although Stanley Kubrick's 'The Shining' is now considered a horror classic, back at the time of its original 1980 theatrical release, it was something of a bust. Arriving that June amidst an almost breathless level of anticipation, audiences and critics alike were ultimately underwhelmed, complaining about the film's slow pace, lack of traditional horror movie shocks, and an over-the-top, scene-chewing star turn by Jack Nicholson. Despite a strong opening weekend, box office quickly plummeted, and 'The Shining' soon became known as the "bummer of the summer." Funny, then, that just as the ghostly apparitions of the film's fictional Overlook Hotel would play tricks on the mind of poor Jack Torrance, so too has the passage time changed the perception of 'The Shining' itself. Many of the same reviewers who lambasted the film for "not being scary" enough back in 1980 now rank it among the most effective horror films ever made, while audiences who hated the film back then now vividly recall being "terrified" by the experience. 'The Shining' has somehow risen from the ashes of its own bad press to redefine itself not only as a seminal work of the genre, but perhaps the most stately, artful horror ever made. By now, most everyone knows the story. Based (very loosely) on the novel by Stephen King, over the course of a few snowbound weeks at the Overlook Hotel, aspiring novelist Torrance (Nicholson) will give new meaning to the phrase "dying for your art." Expecting to finish his "Great American Novel," Jack drags his long-suffering wife Wendy (Shelley Duvall) and young son Danny (Danny Lloyd) to spend a relaxing winter at the cavernous Overlook, but the hotel's previous guests have something else in mind. Haunted by escalating visions of the macabre, Jack's dark impulses will erupt, eventually spiraling into madness (and a fondness for axes). With the oblivious Wendy unable (or unwilling) to see Jack's emerging psychosis, it is only young Danny -- who possess a latent psychic ability, or a "shining" -- who will be able to open her eyes to the evil around them and rescue the family. I love 'The Shining,' but many of the criticisms initially leveled at the film are valid. The pace is as slow as molasses, with Kubrick bucking the rhythms and shocks that traditionally make for an effective horror film. He stretches scenes out well beyond their breaking point (often deflating tension), and misses several golden opportunities for the kind of heart-in-the-mouth scares that a more commercially-minded filmmaker would have spoon-fed to his audience. One imagines that if Kubrick has directed 'Jaws,' right before the big moment where the shark jumps out at Roy Scheider on the boat, he would have cut to a ten-minute shot of the sun setting. Ironically, it's precisely because Kubrick took such an unconventional approach to the traditional machinery of a horror film that 'The Shining' is able to cast such a unique, compelling spell. The film's 148-minute runtime feels twice as long, but because it's such a slow burn, by the time Kubrick springs his climactic succession of shocks on us, they pack that much more of a wallop. Given the none-too-subtle sexual undercurrents in all of his films, it's arguably fair to say that the last 30 minutes of 'The Shining' are orgasmic. Jack's unleashing of fury on his wife and child is so ferociously rendered that it's primal and oozing with palpable subtext. Nowhere is this more evident than when Kubrick slyly reveals his "money shot" in full -- the now-iconic image of a hallway filling with a tidal wave of blood -- a "release" that's so visceral it rises to the level of the operatic. As always, Kubrick is frustrating in his methodical, rigid pacing with 'The Shining,' but he still rightfully earns the title of master manipulator because, like Hitchcock, when he finally rewards our patience it's well worth the wait. Despite a renewed appreciation over the years, not everyone loves 'The Shining.' Stephen King himself remains one of the film's most vocal detractors, routinely slagging off Kubrick's take as a near-desecration of the novel (King would even go so far as to produce his own version of 'The Shining' as a mini-series for television in 1997). Certainly, Kubrick has jettisoned most of the novel's most overt supernatural underpinnings, and his casting choices are also quite a departure from King's vision (particularly Duvall's Wendy, who is far removed from the blonde beauty of the book). Kubrick can also be so oblique in his use of visual metaphor that at times it renders the story nearly incomprehensible. Nowhere is this more evident that during the film's final ten minutes, as the scope of the hotel's past perversity is finally revealed to Wendy (and the audience) in images that have now become legendary in their unintentional hilarity. (If anyone out there knows just what the heck Wendy's vision of two guys dressed in bunny costumes going down on each other has to do with anything, please send me an email). As such, it's not surprising that so many fans of the novel shared King's outrage. Indeed, as a strict adaptation, Kubrick's 'The Shining' is undoubtedly a failure. Still, 'The Shining' remains fascinating in spite of -- or perhaps precisely because of -- its "flaws." It's a grand, ornate and intelligent horror film -- one far less concerned about delivering the expected shocks and scares than it is in painting an intentionally obtuse portrait of the American family in the grips of madness. Yes, Kubrick is a cold filmmaker who often seems to delight in thwarting our expectations just for the thrill of it, and 'The Shining' is often off-putting. But it's also unmistakably menacing, provocative and filled with enough unforgettable images for ten other movies. The rare genre film that's truly challenging in its complexity, 'The Shining' is a journey that every film fan simply must take at least once. The Shining' may not be the best of Stanley Kubrick's films, but it is my personal favorite, and I think I've owned every single version released on video (both the good and the god-awful). The best of the previous releases was Warner's remastered DVD from 2001, which at last saw the film's picture quality spruced up to something approaching its original glory. Unfortunately, that release was full frame only, and a widescreen 'Shining' that faithfully approximated the film's theatrical exhibition remained elusive. Finally, Warner has delivered the goods, presenting 'The Shining' here in a matted 1.78:1 transfer that's slightly opened up versus the original 1.85:1 theatrical exhibition. Both the Blu-ray and HD DVD feature identical 1080p/VC-1 encodes, and they are both excellent. Although there is still the occasional blemish, this transfer is such a clear improvement over the old, dirty, speckled prints that it's hard to complain. 'The Shining' was always a rather soft film, with considerable use of diffuse lighting, but it's crisp here, offering a level of visible detail that's impressive for a film that's nearly thirty years old. Warner has also wisely not over-sharpened the source, so it remains natural and film-like. Appropriate to the cold and oppressive mood Kubrick intended, the color palette here is muted, but most impressive to me about this new transfer is that, for the first time, the film's visual aesthetic finally comes to life, with subtle uses of select hues now seeming intentional rather than random. From the striking greens and purples of "Room 237," to the intense blue-white floodlights of the climactic hedge maze chase, to the crimson reds Kubrick selectively deploys with clothing, set design and (of course) blood, 'The Shining' at last looks vibrant instead of drab. To be sure, this is still a "'70s film" in feel, but the clarity and richness of hues (not to mention fleshtones that are finally accurate) make this transfer border on the revelatory. 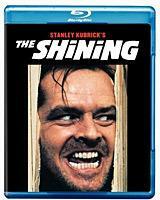 'The Shining' is the latest in a series of recent Warner catalog titles to be graced with high-res audio, boasting PCM 5.1 Surround track (48kHz/16-bit/4.6mpbs) for the Blu-ray, and a companion Dolby TrueHD mix for the HD DVD. Unfortunately, even after doing some A/B comparisons, I felt that the source material was quite frankly a bit too dated to really benefit much from the boost. As Warner has not included the film's original mono track as an option, purists will likely bemoan the 5.1 remix, as it has clearly been post-processed to achieve a surround-like effect. Unfortunately, truly discrete effects are non-existent. The fantastically eerie opening credits establishes the approach, with a limited bleed of Wendy Carlos' terrific score to the rears, and that's just about it. As the movie progresses, bleed is expanded to include very minor ambiance, but rarely is there any noticeable presence to the rears and atmosphere never delivers in the way the movie clearly cries out for. Dynamics range from decent to anemic. Bass never extends deep enough, while high-end feels compressed and flat. Although there are no source issues or obvious harshness, the mix never feels particularly realistic or expansive. Dialogue is generally well produced, but at quieter volumes I had trouble hearing some of the characters, so if you can't turn up the level to a decent degree, you may find yourself flicking on the subtitles from time to time. Given the late Stanley Kubrick's disdain for DVD supplementary material (add him to the hater's club alongside Woody Allen), most of Warner's earlier Kubrick DVD releases haven't boasted much in the way of extras. Rather than simply regurgitating what was on the previous DVD, Warner has also produced a new suite of three featurettes for this release, which is hitting standard-def DVD concurrently. Although I was bracing myself for a bunch of stodgy scholars rehashing the same tired old Kubrick theories, instead Warner has assembled a pretty impressive line-up of talent to discuss the film. Included are new interviews with screenwriter Diane Johnson, composer Wendy Carlos and Mr. Jack Nicholson himself, plus comments from a series of A-list directors, including Steven Spielberg, John Boorman, William Friedkin and frequent Kubrick collaborator Sydney Pollack. Finally, lest you think the featurettes would skimp on the scholarly, also present are authors John Baxter ("Stanley Kubrick: A Biography") and David Hughes ("The Complete Kubrick"). "Wendy Carlos, Composer" runs 7 minutes, and is basically a sit-down chat with the legendary electronic composer. She talks specifically about her approach to the material, and affectionately recounts her warm relationship with Kubrick. Finally, "The Visions of Stanley Kubrick" runs 15 minutes, but it's largely an overview of Kubrick's films, and not really specific to 'The Shining.' It also feels a bit like a digest version of the more substantial documentary found on the 'Eyes Wide Shut' Blu-ray, so if you're picking up all the Kubrick titles, you may find some redundancy. Warner has not stopped at just the featurettes, however. They've also included a real surprise: a full-length audio commentary featuring the film's original Steadicam operator Garrett Brown, and Baxter. I was a bit fearful that this one would be completely dry and boring. But for a film lasting 146 minutes, I was amazed that Brown and Baxter never run out of things to say. Brown is articulate and insightful about working with Kubrick day after day, and provides great detail on some of the film's best sequences -- particularly the climactic hedge maze, as well as the iconic "wall of blood" shot. Baxter is more illuminating on the narrative, though his take on Kubrick's intentions will certainly cause some debate. All in all, a fine commentary. Rounding out the extras is the film's original Theatrical Trailer (more of a teaser, really), presented in 4:3 full screen and 480i/MPEG-2 video. Nearly thirty years later, 'The Shining' still casts a cold, creepy spell that's sure to send a shiver down the spine. Although I was underwhelmed by the remixed high-res audio, otherwise the film's long-anticipated high-def debut is first-rate. The transfer is the best I've ever seen the movie look, and the extras ain't too shabby, either. As a long-time fan of the film, this release lived up to my heightened expectations, so I can recommend it here without reservation.